Neviah Nevi's new album Tales of Terror brings to us a new look on death metal: happiness, sunshine and butterflies. Just kidding, there nothing new, inventive or happy about Tales of Terror. Frankly, it's 'terrorible' (See what I did there?). I know I have complained before about the lack of variation on albums. 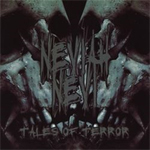 Neviah Nevi have made me think I may judged a few other albums a bit harshly for this, since Tales of Terror makes previously reviewed albums seem as complex and interesting as The Beatles' The White Album. On Tales of Terror, every song sounds copied and pasted from the ones before it. If there wasn't a pause between each songs, I would have assumed the album was one long track. Drums don't noticeably change tempo during the entire album and the death metal vocals might as well be saying 'I like potatoes' over and over and no one would notice. This brings me to my biggest complaint and an observation on death metal/metalcore in general. While I attempted to give the benefit of the doubt to vocalists who use 'cookie monster' vocals, I can't help but to think they are compensating for a lack of vocal skills. However, on tracks like 'No Escape' and 'Blood Stained Hands', vocalist DeAngela sings normally, and it's really good! It honestly blows my mind to think that this excellent talent is being wasted with the death metal type vocals. Although changing the vocals wouldn't have saved Tales of Terror from mediocrity, it certainly would have helped. Tales of Terror is about as much fun as root canal and a lot more excruciating. Recommended only to those without a good dentist.